Exhibition of Aural fixations at the City | Data | Future exhibition. It presents a series of visions depicting what it might be like to live in a near future city saturated with data. Each piece will question what this might mean for our changing relationship with the city and its citizens. As a part of a electricity usage visualization project with inudgeyou.com, I developed multiple prototypes. One such prototype is an internet enabled lamp (internet of things). The lamp uses a NodeMCU control board and neopixels. It can be programmed to change color depending of the electricity usage through the internet via Wifi. To aesthetically deviate from the usual laser cut acrylic, often found in Fablabs, he made a shield out of metal. The shield was cut on the Fablabs new metal laser cutter. Experimental installation which reverses the purpose of light. Instead of spreading light outwards it sends it inwards. Each light can be controlled individually. I am curios about the movement of the shadows on the walls when installed with a 12 channel controller in the right setting. 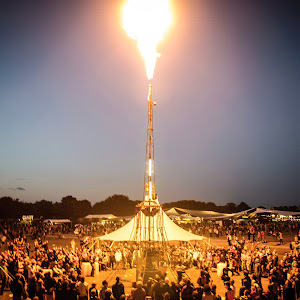 illutron redesigned Explosion Village for Skanderborg festival 2015. The installation consisted of a big fire cannon mounted at the main entrance of the festival. The participants could trigger the canon by playing together on oil drums. At the Borderland Festival I designed a light installation that stood on top of a hill and made animations pointing towards the sky. It became an odd and improvised contraption that gave the impression of outer terrestrial technology. After the installations was installed other participants of the Festival improvised around it by using it as a prop for their own imaginations. Even a space alien dropped by and communicated with it. 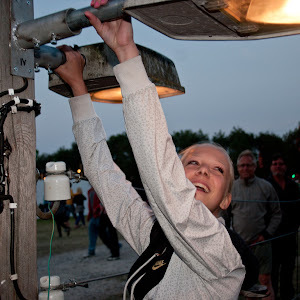 I helped make the entrance markers for Roskilde Festival 2015 interactive - the audience can change the colour of the LED lights in them by visiting rf.illutron.dk with their smartphone. “Dystopian fiction’s popularity is a warning sign for the future” worries renowned author and cultural critic Naomi Klein (2014a). For Klein, human made climate change does not call for adaptation or mitigation; it is a civilizational wake-up call. Confronting the apocalypse is not about “changing light bulbs” - it is about change, about transforming the “social system” causing human extinction, about revolting against capitalism (2014b). Dystopian scenarios do not leave much scope for this. In the face of climatic catastrophe, sci-fi authors tend to affirm the inevitable, leaving room only for either apathy or individualist survivalism, stockpiling food and fuel. Robot technology has been reserved for the industry since the 70´s. At Fablab RUC we have been working on changing that. 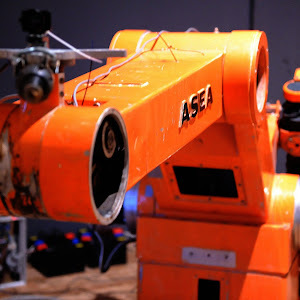 WE have build a industrial robot arm that cost a fraction of what a normal arm cost. This allows people to build it themselves and it gives people the freedom to experiment with it. It costs less than 1000 dollars, thus enabling small local productions to use robots in their processes without breaking the bank. It is a product of a 3 day sprint. Binaural installation consisting of a replicate of human ears. Each ear has a build in microphone. The sound from the ears are transferred to a remote location where a person can listen from inside the art piece itself. The natural shape of the ear mimics the distortion found if listening with ones own ears. N7331227 installation is now a part of the permanent exhibition at the Danish Technical Museum. It represents 1970s technical enginuity and illutrons ability to repurpose technology in new ways. 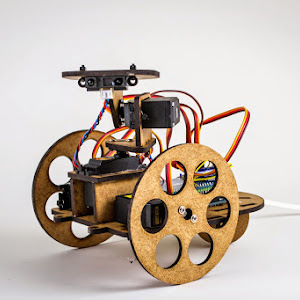 With Illutron, I build an autonomous robot that roams around the space of the Danish Technical Museum. It is a bit confused, but if you catch her attention she will strike a polite conversation with you and follow you for a bit. I taught the IxD masters program at Umea Design School about interactive robotics. We used the concept of Animism as a theme. Here are a few images of the projects they came up with. We posit that modern fabrication and rapid prototyping practices can empower non-technical academic environments. For this to resonate with academic learning and research environments in a university context we must view FabLabs not only as machine parks but as creative environments, producing knowledge contributions in the form of processes, designs, artifacts and products. We must embrace thinking through the material, and embrace physical products as valid, accessible and assessable on an equal footing with traditional textual media. We describe two cases: workshops focused on exploration through the physical and digital media itself, without a traditional textual component. 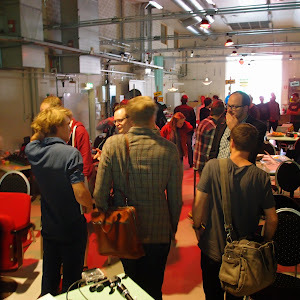 I co-organised the Traffic Jam Hackathon at Medea Malmö. Traffic Jam Session is an innovation challenge where we prototype the future of public transportation. All hackers, creators, makers and thinkers were invited to the event that gave 36 hours of insight into the future of public transportation. At Fablab RUC I co-designed a hackable robotics platform to be used in workshops for high school and university students. Participants built a robot, gave it personality and experimented with the interaction between humans and technology. We provided laser cut robot parts, the Arduino open source rapid prototyping platform, electronics and programming building blocks. A single distance sensor and different behaviours coded as modular functions allow a range of behaviours to be combined. I had the honour to present my bag of failures at Bits and Beers. Fablab RUC is an experimental research lab focused on maker culture and empowering academia to use rapid prototyping in materials as a basis for conversations with the real world. 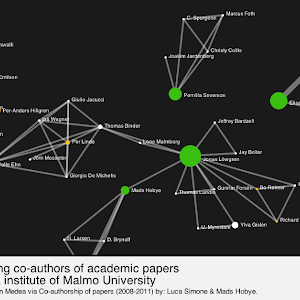 Students, researchers and the public are free to use it to build based on their own curiosity. I have been employed since April 2014, part time, as a supervisor on interaction design projects and to develop maker culture as a part of an academic environment. All of the employed people are members of illutron. 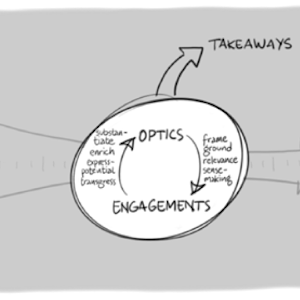 Designing for Homo Explorens is a compositional design perspective within interaction design academia. 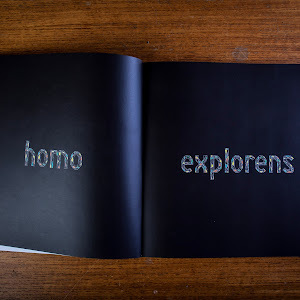 It extends the Homo Ludens view of humans as playful creatures with the perspective of exploratory interaction. It focuses on socially exploratory interaction between participants mediated through designed artifacts. In the form of a Manifesto, four aspects are introduced which highlight important design dimensions to consider in Designing for Homo Explorens. The four aspects of the Manifesto are concerned with creating exploration through internal complexity, experiential exploration through full-body interaction, social playfulness through distortions of situated norms and a frame for performative interactions. 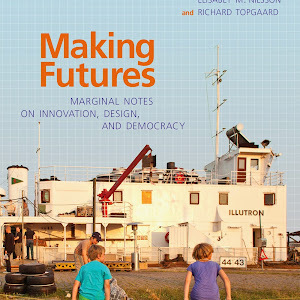 The insights in the four aspects come from knowledge gained through experimenting with twelve working prototypes in real-life contexts, combined with contemporary streams of theory regarding ambiguity, somaesthetics, norms, situatedness and performativity. What is it that makes us emotionally attached to technology and how can we design this? At Roskilde University I did a two week workshop with first year students on the potential of designing for anthropomorphism and animism. 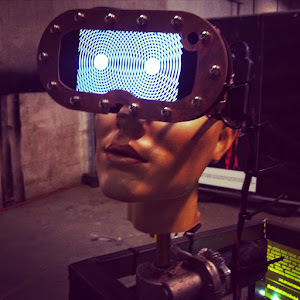 Multiple interactive robots and abstract installations were build. They all invited the user to start making interpretation on the personalities of the installations. 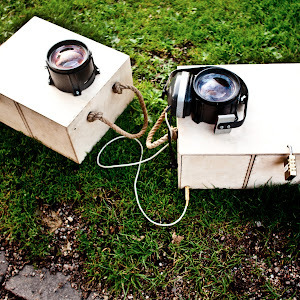 Outer light is a lamp made from upcycled materials and produced on Fablab machinery. The notion of design research entails research where design practice forms part of the knowledge production. Based on our characterization of the nature of design, we propose to conceptualize this kind of research as programmatic design. 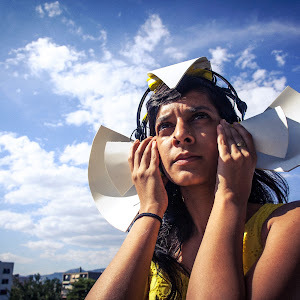 Aural Fixations is a Design Fiction project that contemplates on what it means to listen to the voices of the city - it has been contextualized to the city of Split, Croatia. We present five design cases as an annotated portfolio, exploring ways to design for intimate, interpersonal touch and social intimacy in interaction design. Five key qualities are elicited from the cases, including novel connotations sparking curiosity; providing an excuse to interact; unfolding internal complexity; social ambiguity; norm-bending intimacy. 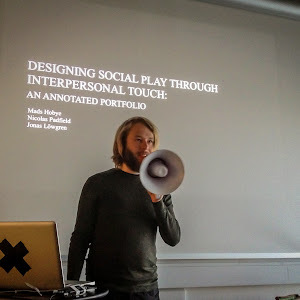 The work highlights novel interaction design approaches fostering social play, turning participants into performers of their own narratives. 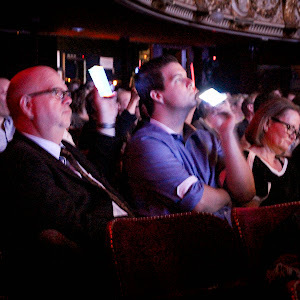 For the first time, the Royal Danish Theatre’s audience could be active co-creators of the concert experience by using their mobile phones. This within the Interreg project Musikalsk Oplevelsesdesign where three cultural institutions, two academic institutions and the Øresund commitee collaborate in developing new audience engagement concepts within classical music and performing arts. 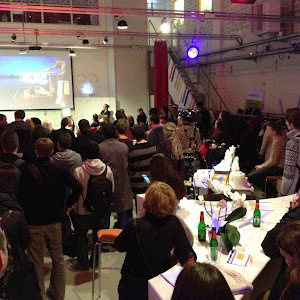 I ran the 24 hour hackaton at Medea together with colleagues and members of illutron. Connectivity Lab Live celebrated the new Connectivity Lab at Medea with a two-day creators event exploring innovative prototyping in the field of connected devices and social media. The event gathers visionaries, designers, programmers, makers and other creative minds for ideas and inspiration, talks, workshops, exhibitions and a 24-hour prototype challenge at Medea, Malmö University the 7-8 December. What happens when a community of creative people take over a 50-year-old barge and decide to use it to build large-scale interactive installations? 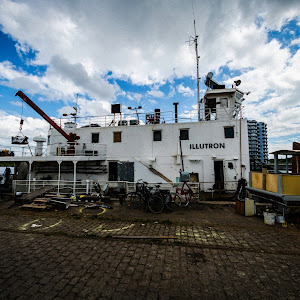 illutron is a collaborative interactive art studio located on Copenhagen’s south harbor. 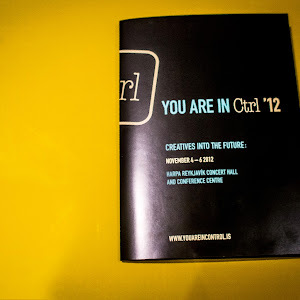 Its members are artists, designers, performers, programmers, electricians, musicians and electronics wizards. The group started with two primary values: to create a community around the creative artistic usage of technology, and to build an open platform where individuals could explore their own curiosity. Founding Illutron member and interactive designer Mads Høbye will talk about how the studio was founded, some of their remarkable installations and the intertwined social, technical and artistic processes encapsulate its community. 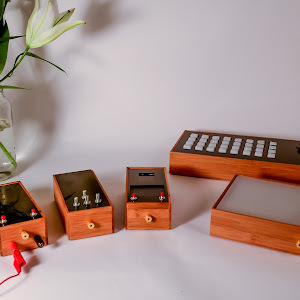 As a part of being an artist-in-residence at [Instructables](http://instructables.com), I took it upon myself to build of couple of noise machines / music boxes. My interest was in designing objects that would enable people to explore the world of sound synthesis and for me to get a better understanding of how the different interfaces enables different interactions and sound qualities. This is a part of an ongoing investigation on creating interactions for curiosity. The first thing you see is a strange-looking wooden box with a vintage light bulb and an analogue meter. It looks like a quasi- scientific instrument from the 60’s that will measure your health and serve to convince you to buy snake oil or to join a cult. The appearance was designed to spark your curiosity and set you in a mood for exploring the system. 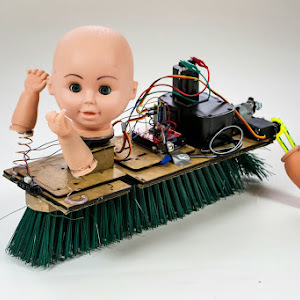 I was granted an artist-in-residence at Instructables for September 2012. Instructables is a web-based documentation platform where passionate people share projects they do, and how to do it. Because of the creative nature of the website, Instructables also have lab facilities for their own co-workers and for artist-in-residences. During September, I had the honor to use their lab to build and document multiple prototypes to be shared on their website. 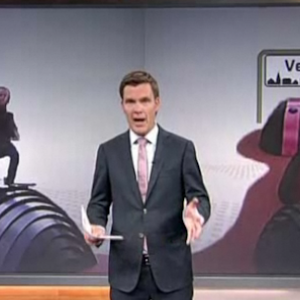 Three Danish cities have robotics playgrounds where children can send messages and light to the playgrounds in the other cities. At CHI 2012, I was introduced to the Touché interface. Touché is a new sensing technology that can not only detect a touch event, but simultaneously recognize complex configurations of the human hands and body during touch interaction. Developed by Disney Research Lab, Touché significantly enhances touch interaction in a broad range of applications, from enhancing conventional touchscreens to designing interaction scenarios for unique use contexts and materials. For example, you can add complex touch and gesture sensitivity not only to computing devices and everyday objects, but also to the human body and liquids. I asked my friend DZL if he could design a version that worked on the Arduino platform. 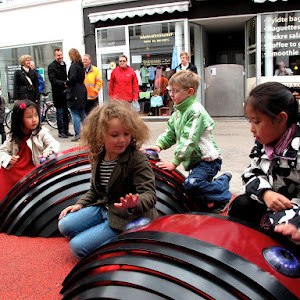 A playground in Odense is an interactive dreamspace. It is linked to similar places in Esbjerg and Vejle, and you create patterns of light and sound together with children and adults in the other cities. Playspot is designed to be a dynamic and explorative play area across the three cities. Touchbox: Intriguing touch between strangers. 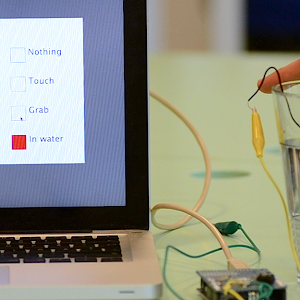 The Touchbox is about facilitating intriguing touch interaction between strangers. The Participants each wear a pair of headphones, and when they touch each others bare skin, they both hear a complex sound pattern. Previous (successful) work involved a skilled Performer and one Participant; the Touchbox was designed to be played by pairs of pristine Participants exploring the interaction situation on their own. It turned out that their interaction experiences were quite engaging albeit more varied in mood and character. The Touchbox illustrates a novel approach to embodied interaction design where social norms are transcended by means of daring and captivating interactions. This work addresses Mediated Body, a design study in the field of embodied interaction. 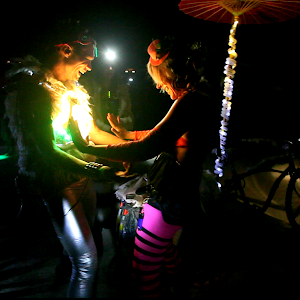 Briefly, the Mediated Body entails a Suit worn by a Performer engaging in social play with a Participant. 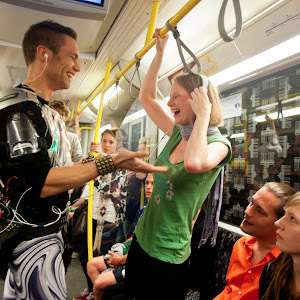 The Performer and the Participant each wear a pair of headphones, and when they touch each others’ bare skin, they both hear a complex sound pattern.The interaction takes place in a public place in full view of bystanders and spectators, who play the socially significant role of the Audience in the use situation. Smootbooth is an experimental social photo platform. It has been used over 100 times in all kinds of settings. From conferences for large scale companies to subversive and playful underground events where people dress up in outrageous costumes. The key element in the booth is the possibility for the participants to take the pictures themselves. This leaves out the photographer and enables the participants to use the space as an excuse for social interaction. Multiple modules exists: Green screen, Facebook upload, direct print etc. 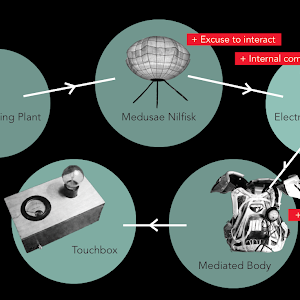 We present Mediated Body, an exploration into designing for engaging experience in embodied interaction. 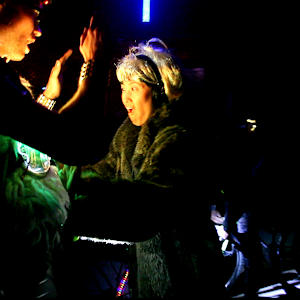 Mediated Body entails a Suit worn by a Performer engaging in social play with a Participant. 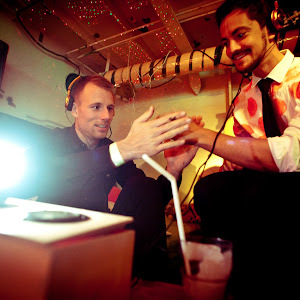 The Performer and the Participant each wear a pair of headphones, and when they touch each other’s bare skin, they both hear a complex sound pattern. Our approach, which we call research-through-explorative-design, is a combination of experimental design in the lab and explorative design in the field, where qualitative assessments are used to elicit transferable knowledge contributions. This paper represents a case study of this somewhat innovative research approach in action. On the topical level, our results include three artifact-level elements that contribute to engaging experience: connecting touch and audio with the right balance between direct and emergent responsivity, justifying bare-skin touch between strangers, and providing open-ended action props with non-trivial internal complexity. 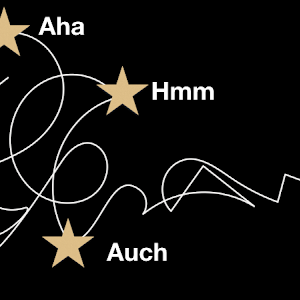 Moreover, we suggest three experiential qualities as analytical tools pertaining to engaging experience in embodied interaction: the duality of performative immersion, the “magic circle” of transformative social play, and the explorative nature of emergent meaning-making. We designed two identical boxes with a little lens that was a window into a virtual compass. The needle always points to the other box. Each box had a compartment which was locked with a combination lock. The combination was written on the other box. This meant that you would only be able to discover, what was in the boxes by searching for its twin. 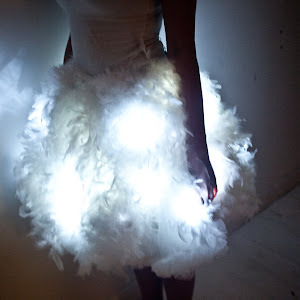 Light dress made out of boa feathers. The light is controlled by a remote. Who is in control depends on who holds the remote . 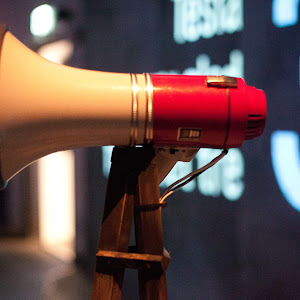 The megaphone project consists of two megaphones, the microphone of one megaphone is connected to the speaker of the other. When you talk in one megaphone your voice comes out of the other, creating an odd feedback loop between two participants representing each others voices. I organized a three-day Hack-A-Thon at illutron, inviting programmers of all levels to show that a device could go further and accomplish more than the task it was designed for. In their hands, mobile devices steered boats, powered secret messages that flashed from the backs of moving bikes, and triggered flame cannons in the pursuit of night time photography. Boundaries were broken and eyebrows singed. For science. Mediated Body is a symbiotic system consisting of a human (the Performer) wearing custom-built technology (the Suit). The system offers a play session to a single Participant at a time. The role of the technology is to sense physical bare-skin connection between the Performer and the Participant. The sensing yields analogue values in a range starting from a few centimeters from actual touch, via light touch, to full contact. Electrolumen consists of a telephone pole, only two meters tall, with four street lamps mounted right above head height. Four wires looking exactly like standard aerial high voltage electrical cable are mounted on real ceramic insulators and go off at chest height to another telephone pole several meters away. N7331227 is an old industrial robot which has originally been used to grind toilet seats. It was given a new life and a new home at the art museum Kunsthallen Brandts in Odense from August 21th to November 29th 2009. 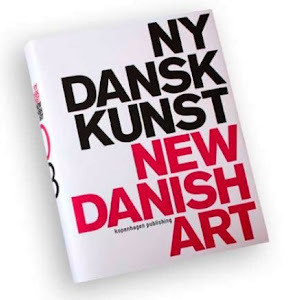 My work was presented in the book New Danish Art 2008. This project took a critical design approach to challenging the social norms of gender specific toilets with the hidden motive of facilitating social interaction between the genders. Creating a social connection with a stranger in a night club is difficult. This is a paradox to us since socializing is a primary purpose of a night club. Social norms tell us to have a reason to initiate contact. As a result, people look for excuses to engage in social activity. Ladies and mens room mix up. A critical design perspective on social norms at a clubbing environment. In an effort to facilitate contact between people at a night club, we created a need for people to communicate: to clarify a confusing situation. This article explains how we developed a prototype for a restroom gender sign switcher, which operated both automatically and as a result of human interaction and input. We explore aspects of communication, question social norms, and explore how critical design can be used to change the dynamic of communication in the context of a night club. Barcode Beats is a system that converts barcodes into music through an interpretation of the numbers on the barcodes. It is intriguing to see everyday items, like a litre of milk, transform into sound. The participant uses a standard barcode scanner to scan a barcode and hear what sounds are produced. The village is built around the Explosion Tower, which looks like a mix of a derrick and the Eiffel Tower. It is surrounded by luminous stones, and when you make grooves with others on these stones, shooting flames are released from the top of tower out into the sky. Half Machine and Illutron presented an interactive traffic installation for the opening of Cph ADD (Copenhagen Architecture and Design Days). 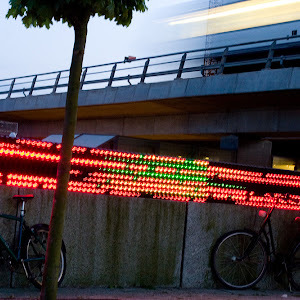 The antique diode displays ‘listened’ to the traffic around Ørestad Metro station and played along then the trains passed by. Red & green light patterns were triggered by the passing trains and cars on the highway. The installation is in a room with only one entrance, as first impressions and POV is of the essence to the installation. Behind the screen a gigantic colorful pulsating spectacle is taking place. The curious visitor will attempt to explore this event. 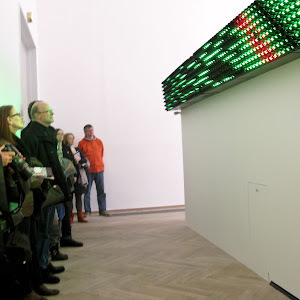 But when the visitor turns the corner, their presence is sensed and the spectacle stops, by switching off all LEDs. If the visitor wants to enjoy the light show he/she now has to adjust to the conditions, standing still long enough for the machines to get used to the visitors presence. By standing, waiting, for a moment, the machines will resume their light- party for the visitors to enjoy. The visitor will be able to join the party until another visitor arrives and triggers the motion sensors, turning the LEDs off again. The Illutron studio was formed in 2007 by a group of people with a wide range of backgrounds: artists, performers, programmers, electricians, musicians and electronics wizards. The group started with two primary values: to create a community around creative, artistic usage of technology, and to build an open platform where people could explore driven by their own curiosity. You did not have to justify yourself and your work; it was inherent in the culture that somehow, someday your little experiment would find a greater role in an interactive art installation in a gallery or in playful contexts at festivals and events. 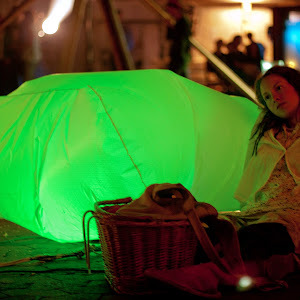 The Medusae spheres, made from recycled parachute material, are lit from within, and cycle through the colour spectrum. They are suspended by antique Nilfisk vacuum cleaners. A propane driven flamethrower ignites when people make human contact between two poles on the ground. 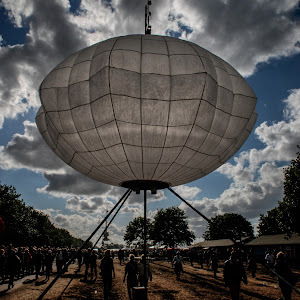 The Medusae Nilfisk was originally commissioned by Roskilde Music Festival (largest music festival in Northern Europe) in 2007. Clouds that smoothly change color and floats on the ground. 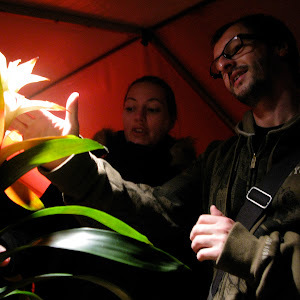 The singing plant is an interactive sound and light installation using a living green house plant as the sole interactive interface element. It is based upon one of the first electronic musical instruments - the theremin, named after its inventor, the Russian professor Léon Theremin. The theremin works by sending an AC signal to an antenna and measuring the attenuation and distortion of the signal by the watery capacitance of a human body nearby. Drømmer jeg...? indeholder mere end 25 artikler fra konkurrencer om informationssamfundet år 2000. Artiklerne er et udpluk af de bedste bidrag fra begge konkurrencer. Bogen, som er udgivet af Forskningsministeriet, er inspirerende læsning, skrevet af en bred kreds af mennesker. Man præsenteres for et hav af eksempler på, hvorledes teknisk udvikling fremover kan gøre vores hverdag endnu bedre - og ikke mindst mere interessant.